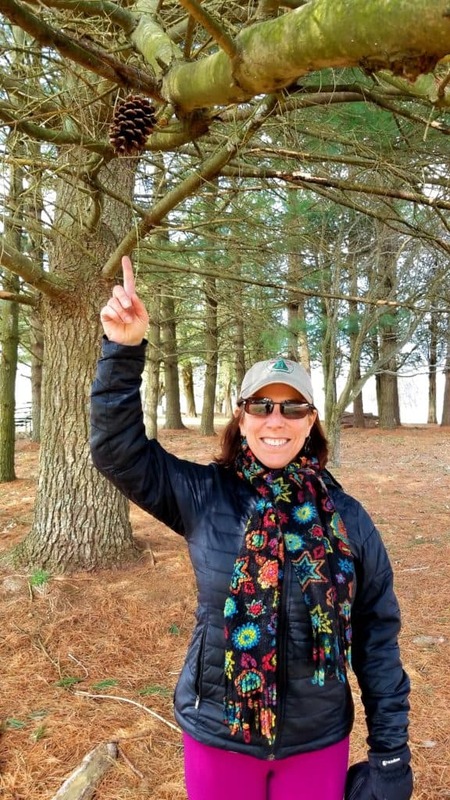 Every spring, geocachers from all around the state are challenged to find 10 “treasures” throughout Maryland. Cache Across Maryland (CAM) was developed by the Maryland Geocaching Society to show off Maryland’s status as America in Miniature. In mid-March, 10 caches in eight different counties were released. Each cache was a container containing an image, and if you were able to capture all 10, you’d receive a decoder that revealed the coordinates for the annual CAM picnic. Stepping Stone Farm Museum in Havre de Grace. The weather was spectacular on the first weekend, so we went after the two CAM caches in Susquehanna State Park. The first took us to the beautiful grounds of Stepping Stone Farm Museum in Havre de Grace. 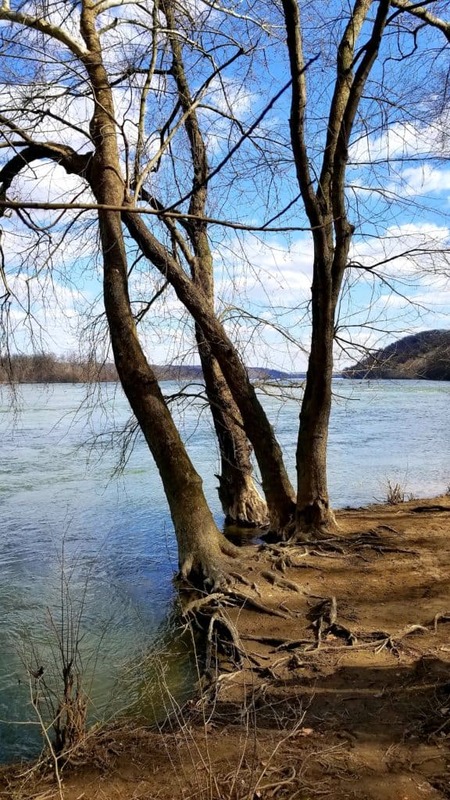 After passing historical farm equipment, a chicken coop, and old utility buildings like the blacksmith, wood shop, machine barn, corn crib and cannery, we hiked down a trail towards the Susquehanna River, off in the distance. 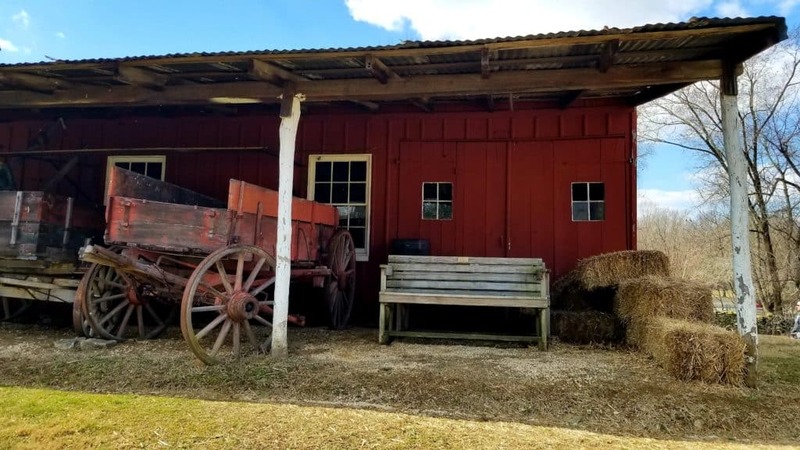 The museum grounds open for the season with a celebration on April 6, where you can meet the blacksmith, woodworker, wheelwright and other farm employees. The shores of the Susquehanna. For the next search, we picked up the Greenways trail, a flat route through a thick forest, perfect for biking. We took a turn to the right and went to the end of the peninsula to find our cache in a beautiful spot right on the river, where the trees lean out over the water. We could have spent hours listening to the river gurgle past, but after our total of five miles hiking, we were ready for a tasty beverage at one of three farm breweries on our list. 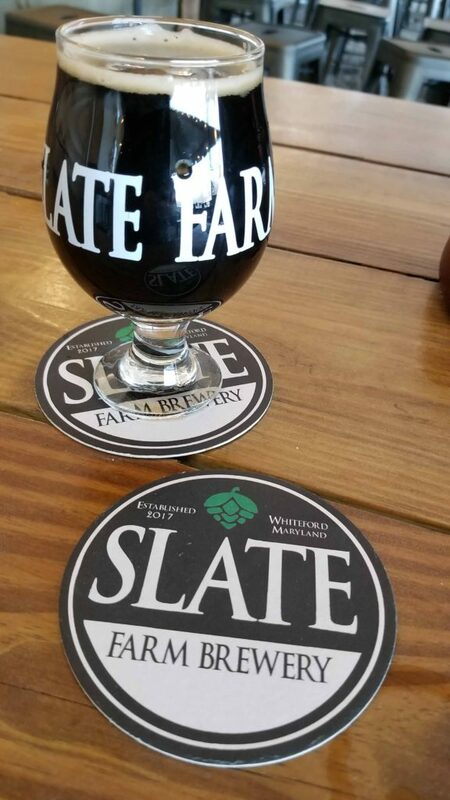 We chose the closest, Slate Farm Brewery, less than 6 miles away in Whiteford. We drove up to a farm sporting a party tent and a food truck. Ten beers were listed on the chalkboard and we didn’t know where to start. Fortunately, we were offered samples before settling on a pour. We chatted with the brewer, Kiel Brown, who told us about the strawberry field and blackberry bushes that supply fruit for his popular strawberry blonde and Badass Blackberry Brut IPA (one of my favorites). Slate Farm Brewery in Whiteford. Slate Farm was celebrating its first anniversary, and preparing to open up a new taproom in a couple of weeks. Brown took us on a tour to see the small brewing system and the bourbon barrels use for Tyrant, the barrel-aged imperial stout. Tyrant is a delicious, complex and earthy stout with minimal boozy taste for a 13 percent beer, but with all the flavor of bourbon. It was the best adult milkshake I’ve ever had. As we toured the new taproom that will be completed by mid-April or thereabouts, Brown pointed out over the rolling hills of Harford County, to the acres where he plants the hops for his beer. The 300-plus plants include Cascade, Centennial, and Nugget. Slate sells its beer at the Bel Air Farmer’s Market, and at farmer’s markets in Baltimore. What a family-run treasure! A treasure trove of beer at Slate Farm.